Home / Viral / world / Because of the strange sounds they heard from their attic, couple installed a CCTV camera and this is what they found out! Because of the strange sounds they heard from their attic, couple installed a CCTV camera and this is what they found out! What would you do if you heard creepy noises above your home? Would you think it's just animals playing around or something else? Would you check it out or would you even be bothered by it? This story would make you think about doing a double check on every inch of your walls to make sure that nothing-- or no one rather, is trying to get in. Recently, there was an incident in Pittsburgh where a man was caught sneaking into his neighbor's attic! The man was actually attempting to take a peak at their bedroom through a vent! Jerome Kennedy and his wife recently had a baby. Then one night they kept hearing strange sounds coming from aboce them. 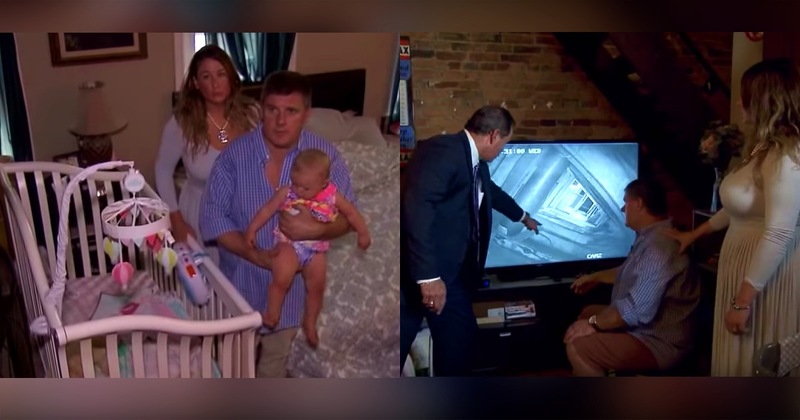 To keep them safe, Jerome wisely placed a CCTV camera above their room to monitor any suspicious behavior that may have been occuring in their home. And to they utter surprise, they saw a man who they later found to be their neighbor, Robert Harvilla, crawling around their attic! He was caught red handed walking through a false wall that he made, climbing onto the ceiling and stopping directly aboce their baby's crib! When the police questioned Harvilla about what happened, he denied doing anything he was accused of! "The only thing I can assume is he's watching my baby, my wife, or myself." "I think it will come out soon that he did not have a malicious intent at all. I think it was an innocent situation that is getting drug out a little further than it should, but that will come out soon." "It's very disheartening to feel violated in this way that somebody can come in and disrupt the sanctity of my home, it's indescribable." He also mentioned seeing noticeable drill holes in the common brick wall they shared as neighbors. When questioned, the 69-year-old suspect only said he had been doing construction. What do you think? Is the old man guilty or not?